Cozy guest apartment with private entrance on walkout level of large home. Quiet location amongst tall pine trees on Talcott Mountain. Large private space with living area, kitchen with microwave & refrigerator, desk & computer, bedroom & bath with shower. Cable TV and WIFI included. On Bloomfield Simsbury line close to hiking trails, kayaking, and the Farmington Greenway Bike Trail. Ten minutes from Bloomfield based insurance companies, 20-minutes from Hartford/Springfield Airport and Hartford. The private apartment or guest suite is located just a few minutes from some of the best hiking and cycling in New England. The Farmington River is also nearby which offers and paddle free journey through our historic wooded area. Kayaks and bikes are available. The entire private apartment (1200 square feet) is available to our guests. It includes a spacious living room area with smart TV, office desk, kitchen, bedroom with privacy doors and bathroom with a large shower. Outdoor activities are just one of the highlights of the area. There are also major attractions such as the Mark Twain house, historic sites, and country fairs are just minutes away. The fall is one of the best times to come to Connecticut. We’re an accommodating, we’ll-traveled couple in our 50’ and 60’s with one dog. We’re professionals in the fields of marketing and the arts. Our peaceful, eclectic home is filled with art and music, and we have always enjoyed creating a welcoming atmosphere for guests. We enjoy meeting new people, and look forward to welcoming you to our Connecticut Forest Home and our Florida Palm House. Guest will enjoy our private apartment located in our large Tudor home. Located on 4 wooded acres, this noise free setting is located just minutes from New England's best hiking biking & kayaking. Bikes and kayaks are available if you are unable to bring your own (rental fee may apply). Beautiful apartment in lovely, private setting. Many nice touches, yogurt, coffee, snacks and cozy socks. We were only there for one night and were wishing our stay could have been longer. We were only passing through from AZ to Albany to Hartford for my daughter's soccer game. It was cozy and charming. Perfectly decorated. Don't pass up staying at this beautiful apartment. The coffee table books were a nice touch. "Five" loved it. If we are ever in the area again, we will definitely look up this perfect cozy apartment in the woods. Thank you!! The description says it all! Very cozy, and comfortable with a gas fireplace as a nice touch. Very clean and everything is brand new. Thanks also for the treats, bottled water, coffee and a surprise pool table. Wish we could have stayed longer and hope to visit again. We definitely recommend this property with 5 +stars! My husband and I stayed at this location for a weekend getaway. The apartment is absolutely beautiful and in a quiet location. Just what we were looking for. The owners are wonderful people and make you feel right at home. We will be back again for another weeknd stay. Thanks for making us feel welcomed. Well, it is my honor to be the first to review this wonderful property. Simply stated, if you are in this area, you would be delighted with the opportunity to experience this exceptional unit. It is in a very quiet location, surrounded by scenic woods. The apartment is large, spacious, comfortable and beautifully crafted. We could not have been more pleased. The owner, Brad, was very accommodating, and it was obvious that he and his wife have given a lot of thought to addressing the needs of their renters. 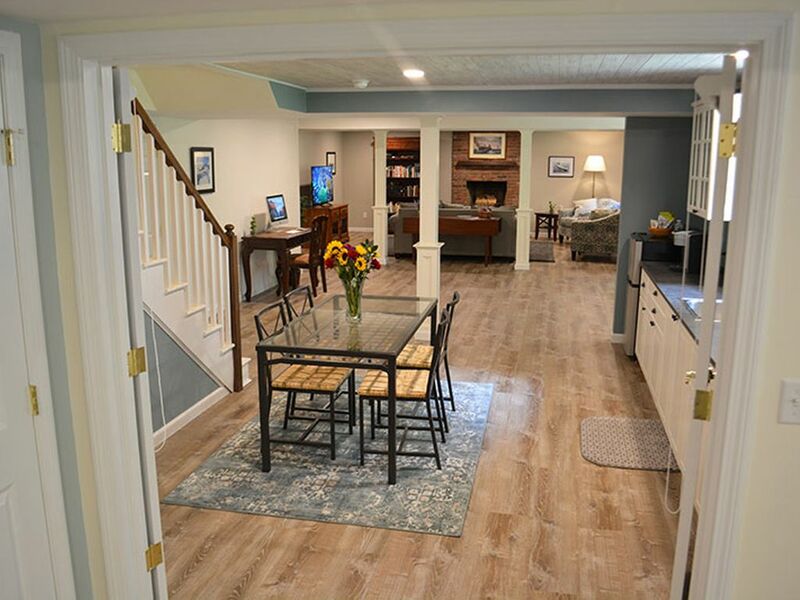 We will be returning to this area of Connecticut on many occasions, and we hope be able to enjoy this apartment on our future visits. Brad, thanks for your great hospitality! Mike, it was our pleasure to have such considerate, kind guests. We're so glad you enjoyed the comfort of the apartment, and are hopeful that it provided you with a peaceful getaway. We'd love to see you again at One Birch any time!